Build a Rocket has come home with a pocket full of awards, accolades and approbation bagged at its appearance at Edinburgh Fringe – the first time the Stephen Joseph Theatre has been represented at the arts festival. Written by Scarborough playwright Chris York, it has been chosen to open the new Edinburgh-to-London transfer festival the Caledonian Express at the Pleasance Theatre in London. 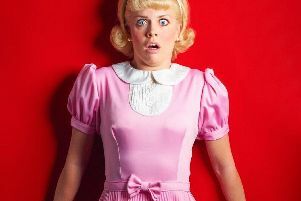 The one-woman show also received the Holden Street Theatres’ Edinburgh Fringe Award 2018, which gives winning shows the chance to take part in the Adelaide Fringe festival. Build a Rocket is the story of teenager Yasmin who falls pregnant while in her last year at secondary school, has her baby and then battles her way through life for herself and son Jack to ensure he has the best start and she does not become a ‘victim’. Serena Manteghi – familiar to Stephen Joseph audiences through her performance as LV in the Rise and Fall of Little Voice last year – plays Yasmin. She hits the stage like a Catherine Wheel shooting verbal stars left, right and centre – often in rhyming couplets like Shakespeare on speed. York’s script is powerfully poetic, angry, energised, enthused, fresh, vibrant, lustful, lascivious and lustrous. He and director Paul Robinson has found an actress in Manteghi up to delivering it – as a fizzing firework which explodes after smoldering for an hour sending a crescendo of blazing sparks across the auditorium. For an hour she stalks, talks, bounces and breezes through a script that never lets up – whether she is talking about a night out with the girls, being dazzled by a fancy flat, the excesses of Christmas Day or the intimacies and intricacies of childbirth. Of course, the Scarborough references – North Bay, the bars, clubs, schools, Dean Road and Tindall Street – make it all the more special and funny for a home audience. What is refreshing about Build a Rocket is its up-beat, positive outlook – what ever besets Yasmin she meets head-on and wins. Her weapons are her word and wit – they are what endear her to you, she is great company. Life may not be a bowl of cherries – but you don’t have to swallow the stones. It is a coming of age story – not just of Yasmin but her son Jack – the other unseen but three-dimensional character of the piece. Sleazy landlords, neglectful mothers, jealous friends and unreliable boyfriends populate Yasmin’s life as she cleans her way to achievement and attainment. Build a Rocket also addresses how mothers affect and influence their daugters – the nature versus nurture question. This is kitchen sink drama for the 21st century – there is the nanny state waiting to pounce but it can be beaten as can class, poltical, geographical and educational barriers. York’s message is: it’s not the hand your dealt but the way you play it that matters. York has written a mult-layered piece which resonates with generations and is directed with Robinson’s trademark verve. Build a Rocket is at the McCarthy studio, Stephen Joseph Theatre from now until Saturday September 8. Performances are: Tuesday August 4 and Wednesday August 5 at 745pm; Thursday August 6 at 7.15pm; Friday at 7.45pm and Saturday at 5.30pm and 7.45pm. There is a free creche for the 5.30pm performance on Saturday. It is at the theatre between 5pm and 7pm, run by qualified staff and for children aged 0 to 12 years. Places must be booked in person or by phone on 01723 370541.